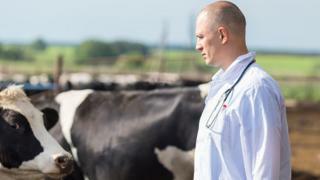 Northern Ireland relies heavily on vets trained in Dublin and restrictions on their work after Brexit could have serious repercussions, it has been claimed. More than half the vets registering with the UK's Royal College of Veterinary Surgeons every year are trained in non-UK colleges. No Northern Ireland university offers training for veterinary science. Many local students train in Dublin before working in Northern Ireland. Reality Check: Where are we really with Brexit? The British Veterinary Association said on Thursday it would be looking to the authorities on both sides of the Irish border to ensure there was no disruption to services. There are about 120 veterinary practices in Northern Ireland, with a quarter of them currently looking to recruit. As well as those trained in the Republic of Ireland, practices in Northern Ireland have vets from a variety of countries including Belgium, the Netherlands and Italy. Speaking ahead of the association's dinner in Belfast, junior vice president Simon Doherty said it was important that vets' "work status" was maintained when the UK leaves the EU. He said if the UK wanted trade deals, vets would be needed to certify animals and produce for export to give consumers confidence. "Currently, each year University College Dublin trains a significant number of veterinary graduates from Northern Ireland, many of whom return home after qualifying," he said. "The impact of the loss of even a small percentage of the veterinary workforce could have serious repercussions on the practices and communities they serve. "We will be looking to the Northern Ireland, UK and Irish governments to consult on how best to ensure that the provision of professional services and trade across the Irish border is not disrupted." Mr Doherty highlighted several other "pressing issues" unique to Northern Ireland. These included the cross-border trade in the agri-food industry and the all-island approach to disease control. He said these made it "crucial" that cross-border co-operation to improve animal health and welfare continued after Brexit.